How Much Vitamin D3? | Elise Hearn's Blog Getting to Know You... Limited Time Offer! Breaking News: Vitamin D Linked to HDL! see below for more on this news! Are You Getting Enough Vitamin D? Recent research shows that Vitamin D—the “sunshine vitamin”—offers a multitude of benefits including supporting healthy heart function, immune and bone health. But, up to 80% of Americans may have insufficient levels of this essential nutrient. Supplemental vitamin D is clinically supported and proven to significantly raise blood levels of vitamin D.
Get the answer with Vitamin D-ology™, a new quiz developed by Shaklee Scientists. Based on the answers to 8 simple questions, the Vitamin D quiz will quickly calculate the Shaklee Health Sciences recommended level of Vitamin D.
Shaklee’s Vita-D3 is the culmination of recent scientific research including two industry-leading Shaklee vitamin D studies. Plus, Shaklee Vita-D3 is subjected to over 300 quality tests to guarantee product purity. Our vitamin D supplement contains 1,000 IU of high potency vitamin D3, the most potent form of vitamin D.
* Live farther from the equator * Have darker skin pigmentation. 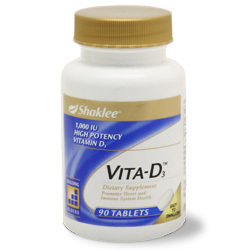 Shaklee’s Vita-D3 is tested for purity and potency, is Star-K kosher certified and is Gluten Free. It contains high potency vitamin D3 and is based on cutting-edge nutrition science. I am so proud to be associated as a Shaklee Independent Distributor with a company whose heritage has always been about improving people’s health and well-being. It’s very exciting that Shaklee has helped to bring this important research to the world. The findings may have significant public health implications related to new understanding about benefits related to vitamin D supplementation.